This is Derwent Bridge Wilderness Resort. The proposed Derwent Bridge Wilderness Resort is arguably one of the most exciting eco-tourism development opportunities in Tasmania. Named after its crossing at the very start of the mighty Derwent River, the small town of Derwent Bridge is the gateway to Tasmania &x92;s stunning western wilderness, being just five kilometres from Lake St. Clair and the world heritage listed Cradle Mountain-Lake St. Clair National Park. Strategically positioned at the halfway point between Hobart and Strahan and being close to the state`s geographical centre, Derwent Bridge is readily accessible by road from all points on the compass. Being near the southern end of the world famous Overland track, Derwent Bridge is the perfect location for an overnight stay by bushwalkers in preparation for a day of leisurely lakeside strolls or longer forest walks. It also makes an ideal hub for those interested in trout fishing in nearby Lake King William or the many other lakes in the area. The surrounding wilderness provides a rich habitat for wildlife, including Tasmanian devils, echidna, platypus and several bird species. The Tasmanian Tiger used to roam freely in these parts. You never know ... you may still spot one today if you`re lucky. The proposed Derwent Bridge Wilderness Resort is one of Tasmania`s most exciting eco-tourism development opportunities. 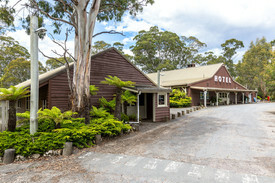 The concept includes the existing profitable Derwent Bridge Wilderness Hotel, which boasts towering ceilings incorporating extensive use of local timber, enormous fireplaces, a popular restaurant which caters for up to 150 people ... along with 7 motel units and backpacker accommodation for 40 people. Development approval has already been issued for the construction of the tavern, 5 shops and 60 motel units strata titled on the Hotel site. An ornamental lake can be provided at minimal cost and requires no permits. The Village site has village site has plans prepared for up to 125 one, two and three bedroom lodge style units. It is also proposed to provide an Activities Centre incorporating a lap pool, gymnasium, sauna and a number of multi-purpose meeting rooms. These two sites constitute the major proportion of the land suitable for commercial and residential development in the Derwent Bridge area. Lindsay`s Paddock, 9.3 hectares of freehold land, can be included in the project if required. Its acquisition will provide a site for staff accommodation or further backpacker accommodation. There are also substantial long-term Tasmanian Government leaseholds. A proposed footbridge over the Derwent River will offer easy access to all areas of the resort. The entire property will provide a full Tasmanian wilderness experience, including bushwalking and trout fishing. The Derwent Bridge Wilderness Resort project is virtually ready for construction to commence. Unlike most Tasmanian wilderness tourism initiatives, this project is offered with almost all necessary permits and approvals already in place. All a developer would need to do is apply for the necessary building permits through Central Highlands Council. Offers over $3.2 Million are now invited from interested parties wishing to become involved in the development of this truly unique opportunity. For more information, contact Andrew Wells at Ray White Southern Tasmania.